So we had the best bus journey ever to Mendoza. We paid $20 for an upgrade and got huge leather seats and wine… We also a good film selection. I started knitting a new pair of socks too and the hours disappeared. I also managed to sleep for eight hours straight which is frankly a miracle in any form of transport! I woke up feeling refreshed and ready to bring it on. Funnily we got woke up with a live concert video of Adele singing which was a bit a bizarre, but strangely nice. We started the day with the obligatory walking tour to the main square and the city centre. 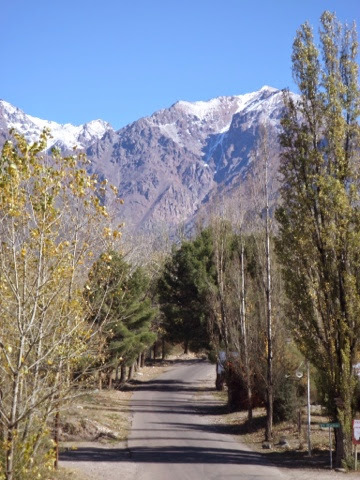 Mendoza is quite a large city with a population of two million people in the wider metropolitan area. We headed to a cafe called Havana, that sells the best Alfahores, biscuits sandwiched with Dulche de Leche and then coated with chocolate. It’s right in the centre of town on aka the pedestrianized street, Peatonal Sarmiento, which is really nice and has a very relaxed vibe to it. In the evening we walked around an artisans market and I bought a nice pair of wood and silver earrings. In the evening we headed to a local restaurant that is based on the food that small gaucho shops used to stock and the walls were covered with pictures and old fashioned wares, including bikes, that they used to sell. The food and wine were great and I shared some great calamari. 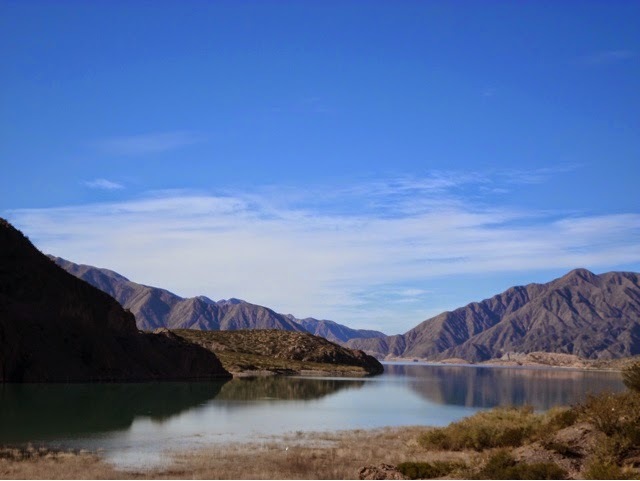 Mendoza is the heart of the wine region and grows 70% of the regions wine, Malbec is the regional varietal. The next day we were all ready and raring to go on our wine tour of Mendoza, with our great guide, Pedro. Pedro used to work as a wine maker at one of the wineries that we visited so he was extremely knowledgeable. 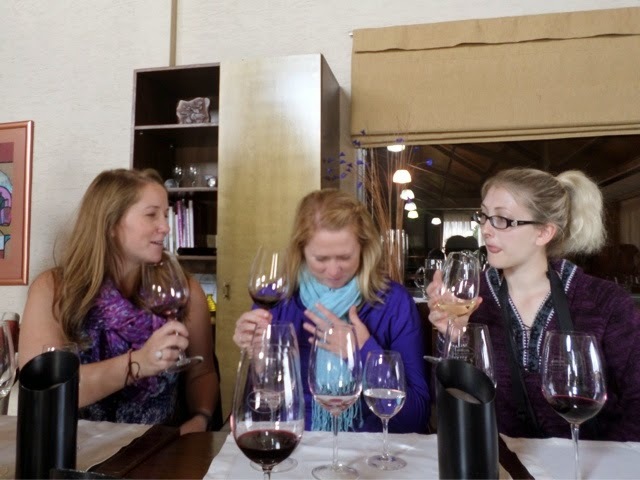 Having been on quite a few wine tours in Australia I have now built up quite a bit of wine knowledge… But there is always room for more education… And more tasting practice…. Our first stop was a boutique vineyard called Caelum. 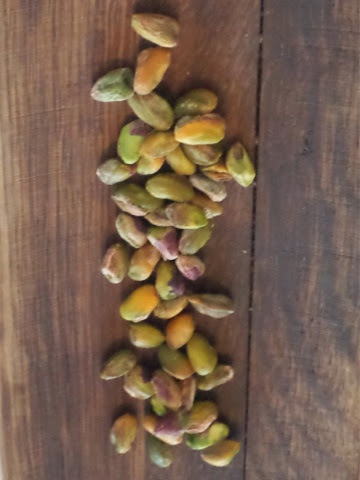 It’s a family owned business and produces around 70,000 litres of wine per year, they also grow pistachio nuts, which is their differentiator. The matriarch of the family bought land and set up a vineyard in Mendoza as an investment despite the family being based in Buenos Aires. During this time they sold the grapes grown to other wineries. 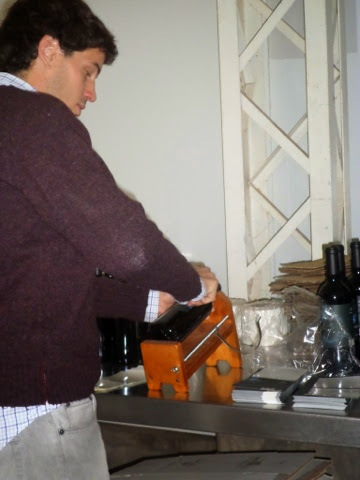 Once the next generation had grown up they decided to make their own wines and all moved to Mendoza. The business is largely run by the brother and sister. The sister covers the commercial side and the brother seems to run things in house. Their wine maker comes from Italy and they have a local man who manages the seasonal staff. There was a fair bit of swooning from the female contingent of the group as the son who manages the tours and tastings is frankly one of the most beautiful men on the planet. The stainless steel vats at Caelum. 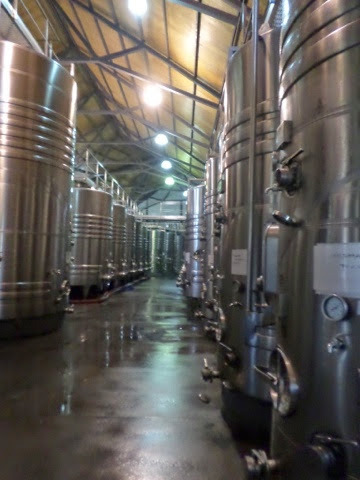 They have ten vats which produce 70,000 litres of wine per year. The winery was named after a constellation, as the family has an interest in astronomy. The constellation is shaped liked a chisel and the combination of the stars and artisans tools was the perfect choice for the family to represent their line of wines. They have two lines, the first has a simple label showing the constellation in silver relief and the second shows different nebulas and they matched the colours of each nebula to the colour of the grape varietals. We tried three wines, a white and two reds. The white was a torrentes and we tasted two Malbecs. I’m not such a fan of whites and I wasn’t bothered about this one. Torrentes is nicknamed ‘the liar’ as it smells like it should be sweet but is actually dry. It is also not a natural varietal. The grape was created as a hybrid between the mission grape, which has been in Argentina for such a long time that they do not know its origin and moscato, which was introduced over here after the Second World War. 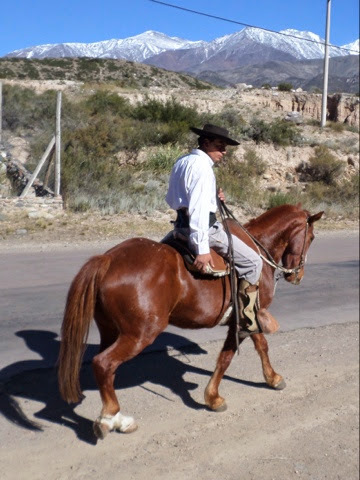 It is unique to Argentina, but is more common further north around the area of Salta than around Mendoza, which is known for its Malbecs. The two Malbecs were both very nice, we had a regular and a reserve. They were both very nice, but the reserve had a richer, deeper flavour that I preferred. 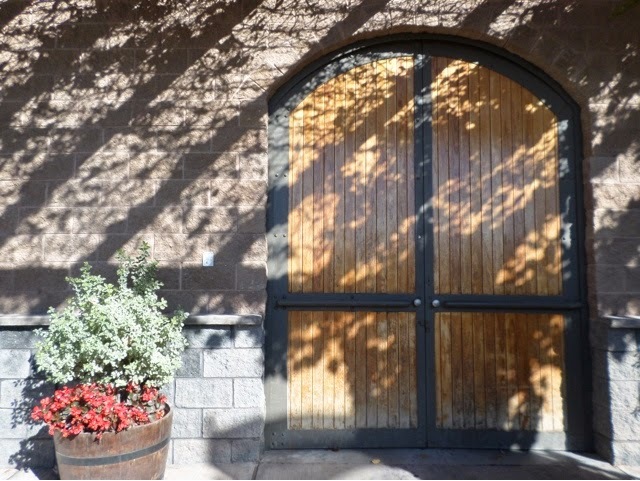 The vineyard is in a beautiful spot and has the most amazing enormous wooden front door…. They also have several super cute dogs. Eventually they are hoping to open a restaurant too, as they have outdoor pizza ovens and a great outdoor patio area. I think it will be lovely once it’s done. They also separate their fields (do you call them fields?) with poplar trees. As it’s coming into autumn the leaves are all turning yellow and red and it looks very pretty. I haven’t been anywhere with a proper autumn in several years and seasons are something I definitely miss in Australia. 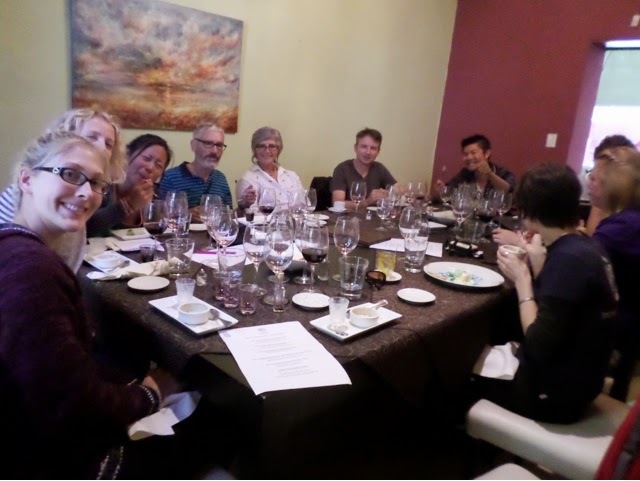 Our group did quite well at the first tasting…. The second vineyard we stopped at, Dominio de Plato, is important as it is run by the first female winemaker, Susan Balbo in Argentina. 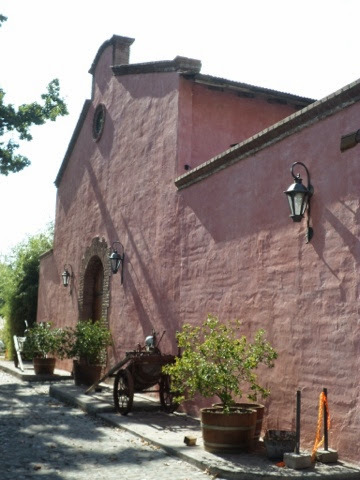 She lap earns the art of winemaking up in Salta, as when she qualified nobody in Mendoza would hire her due to being a woman. In nine short years she established such a reputation that everyone back in Mendoza wanted her. She is now the president of the winemakers association. This vineyard is a lot larger, we had to be checked in by a security guard, but it still felt lovely and quiet and we didn’t see anywhere groups. There is a great big lawn outside their main building and you can actually walk right up to their vines here. 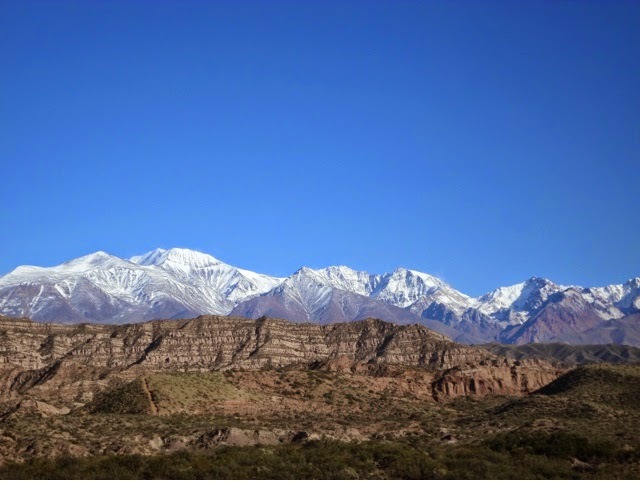 As it is very close to Caelum, there are also the same great views across to the Andes. 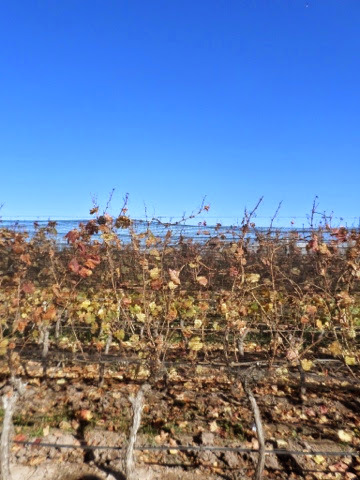 The vines… They are covered with Kevlar netting to protect from hail damage. The entrance… What’s behind the doors…? Again we tasted three wines, one wine and two red. The white was another torrentes, but this one was slightly sweeter in flavour and was nicer than the one we tasted first. We then tried a Malbec and a Cab Sav, I actually liked the Cab Sav best, which was a surprise. They were also a bit stingier with the pouring, but they are a larger vineyard and it definitely didn’t have the same friendly feel to it as Caelum. 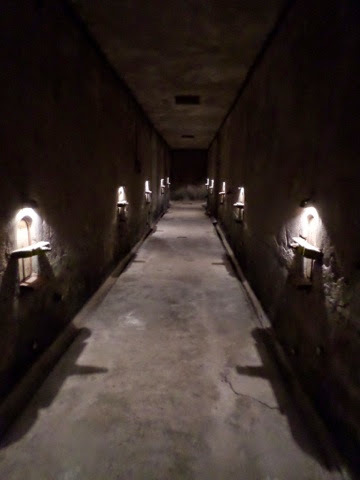 We walked around their cellar, which you can see is enormous in comparison with the first place. They use both stainless steel and concrete vats here. The concrete vats are used for the higher quality wines. They also have a single egg vat, a concrete vat that is shaped like a giant egg. This apparently produces the highest quality wines. We were also told that sometimes they actually use egg white to remove solids in the vat. Egg white is just dropped into the top of the vat, it then causes the solids to coagulate and they drop out. Enjoying a full bodied red. 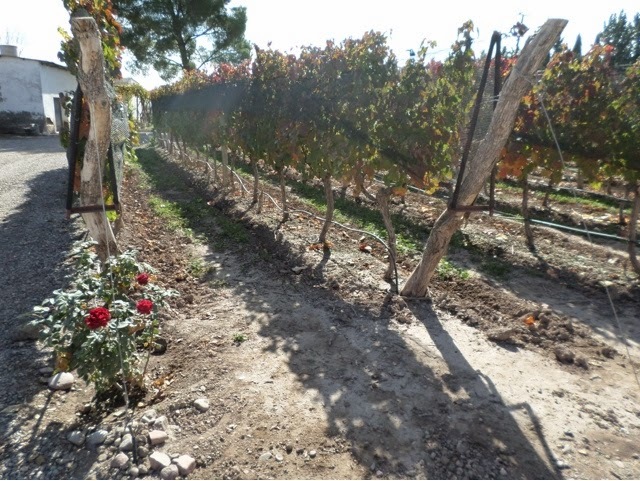 We then headed off to the third and final vineyard, which was my favourite, Close de Chacras. The land was owned by the same single family until the mid-eighteen hundreds when it was sold. The people who then took it over left the site to go to ruin as they couldn’t make a profit. 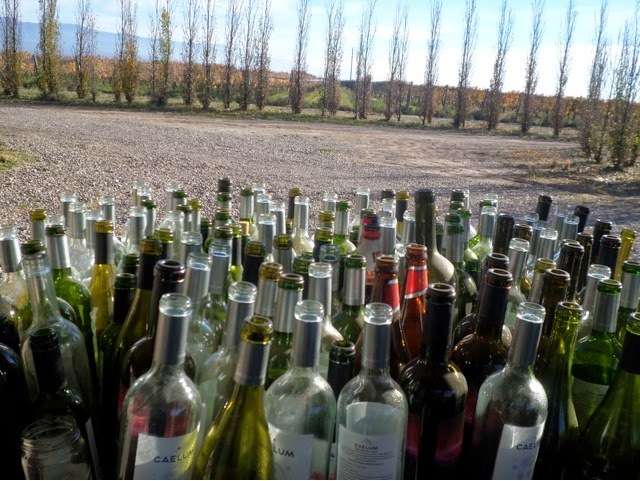 Originally wine in Argentina was produced in high quantities, but very low quality. A female member of the original family then bought back the land at auction in the 1980s and spent fifteen years restoring the buildings. As the originals vines were lost most of the wines here are based on grapes that have been bought from elsewhere. They do have some of their own vines, but they are very young and therefore not currently used. It was also interesting to see the original irrigation systems still in place. As Mendoza is extremely arid the people use a system of aqueducts. Each property is allocated a date and time which they can then draw water from the system. At this vineyard they get to take water every ten days. They now have a water tower, but originally used a system of small lakes, one of which remains, but as a decorative feature only. 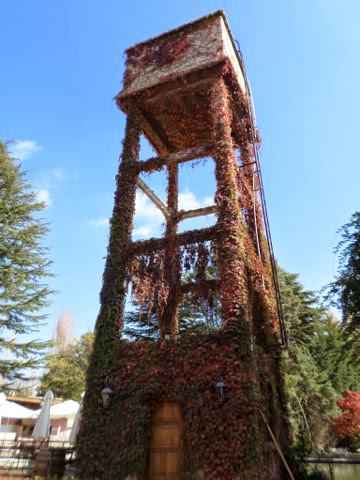 The original water tower, all the leaves were turning red and it looked very pretty. This winery differed from the others in that all its tanks are concrete. You can see the doors at the front which they deal close, the seals are painted with a rubbery paint, but the doors are stainless steel. Historically the doors to the vats were made of wood. 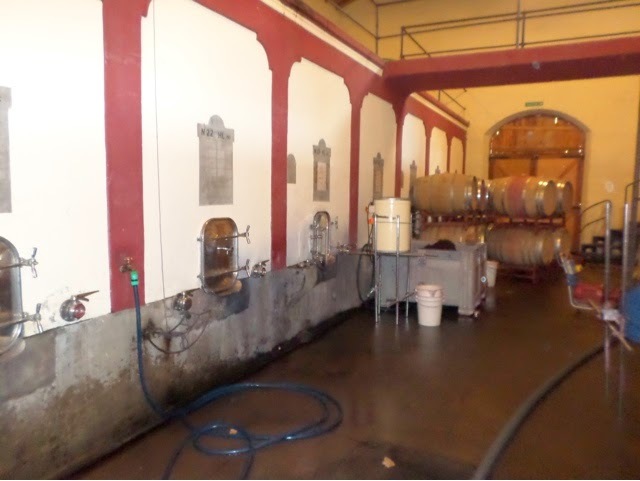 The wine is cycled or ‘pumped over’ by attaching hoses to outlets at the base of the tanks and pumping the wine back into the top of each tank. The labels above each tank show the varietal lf what’s inside. They also still have their original vats down in the cellar, they are far smaller and still have their original wooden doors. It is a bit spooky down there and extremely cold. 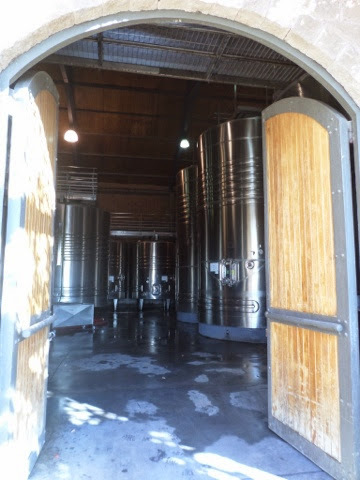 The main storage cellar allowed the winery to storage large quantities of the wine they make, so they can just release it when it is best for sale. They only label the wine bottles once they are ready to be issued to market. After our tour we enjoyed a five course degustation extravaganza! It was amazing, we had all sorts of food and lots of lovely wines, we even stayed for extra and then went out for tea on the lovely terrace by their lake. Wine info/facts picked up throughout the day are all listed below… This is all a bit random and to be honest if you have any wine questions feel free to ask away as I was originally planning to write all about the harvest, production etc. here but I am off having too much fun to take the time to do that now…. Labels… These can be down either by hand or machine. There is a handy top for you to tell which way this has been done. This also will let you know about the size of the winery and their level of production. Hand labelled bottles can be identified as the level will never cross the seam of the glass. Look for the notches at the base of the bottle to identify this point and see how the label is aligned. Labelling by hand is done using a clamp to steady the bottle then sticky labels are put into place. 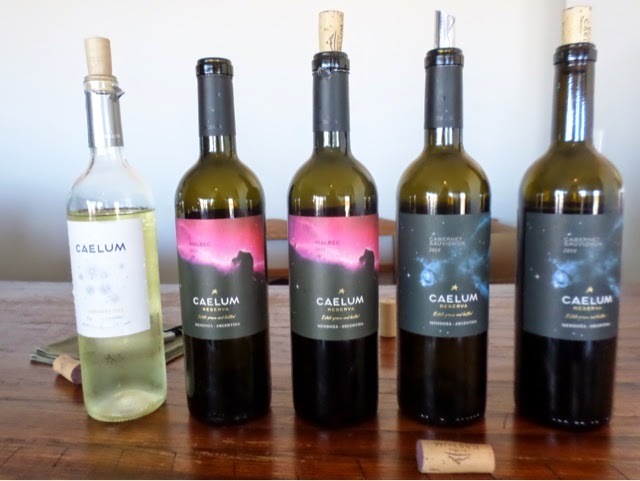 Caelum hand labels all their own bottles and during the time they do their bottling they bring in a special team of women who label over a thousand bottles each per day…. The quality of wines is dependent on the age of the vine and quality of the soil. Wine can be procured from vines from four years onwards, but is best from around forty years. For this reason most vineyards buy spliced older vines rather than growing from seed. Vineyard will also commonly plant other plant types at the end of each row of vines. This allows them to easily check the quality of the soil and therefore the quality of the grape without having the check all the rows. We saw vineyards with both rose bushes and bush that looks similar to lavender. If the roses look good then the grapes are likely to be healthy. The flavour of the wine you drinks comes from a combination of sources. Firstly there is the grape itself and its origin. There are flavours that come from the skin of the grape, which develop in the sun. Different varieties of grape are best suited to different climates, with Malbec suiting hotter and drier areas, compared to say a Pino Noir which is suited to cooler climates such as New Zealand. The flavours derived from the grape itself are referred to as the primary flavours. The secondary flavours come from the fermentation process. The tertiary flavours of the wine, also commonly referred to as the bouquet, come from the ageing process. This is largely down to the use of oak barrels. Wines are usually blended so that only a proportion of the wine has been aged in barrels. The barrels can also be made of American or French oak. French oak is generally preferred as it has smaller prose and gives a smoother, more refines, flavour to the wine. However, it is far more expensive than American oak. Therefore a lot of wineries will use a combination and blend. Is aged in French oak it is likely to be one of the wineries higher class, or reserve, wines. 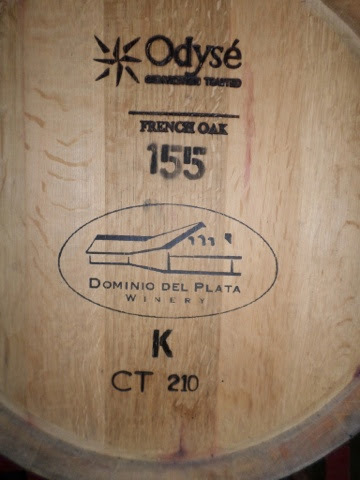 The barrels are all labelled so that you can tell where the barrel was produced, here by Odysé, the oak is French and the winery is Domino del Plata. The winery then labels the batch of barrels received with a letter and number code, here ‘K’, ‘155’. The ‘CT 210’ refers to the level of toasting that the barrel received. 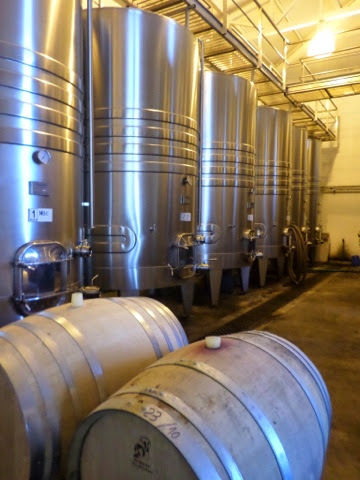 Barrels can have light, medium or heavy toasting and this influences the flavour of the wine. A light toast will give a gentle toasty flavour, a heavy toast will give a smoky, leathery flavour. Generally barrels are only used three times each before being sold on. They generally cost $600-1000 per barrel to purchase and are then sold on at about 100 pesos per barrel to distilleries or for making planters or furniture. Reserve wWines can be classed as reserves based on different things in different countries. In some places it is an indicator that not a single grape has been used, in other cases it is simply an indicator that it is one of the better quality wines that the vineyard produces. Additionally to know whether you are drinking a good year, or vintage, you would really need to have known about the grape variety, the conditions it prefers and the weather experienced that year. For example with a Malbec from Mendoza a good year would be good and dry and would produce a good vintage. A bad vintage would come from cooler wetter year. In this way the La Niña and El Niño cycles are important also. You would also want to compare the age of the wine with the year it is from as wines have a window when they are at their best. Ideally for wines aged for a single year they are best drunk between two to six years past the year printed on the bottle. 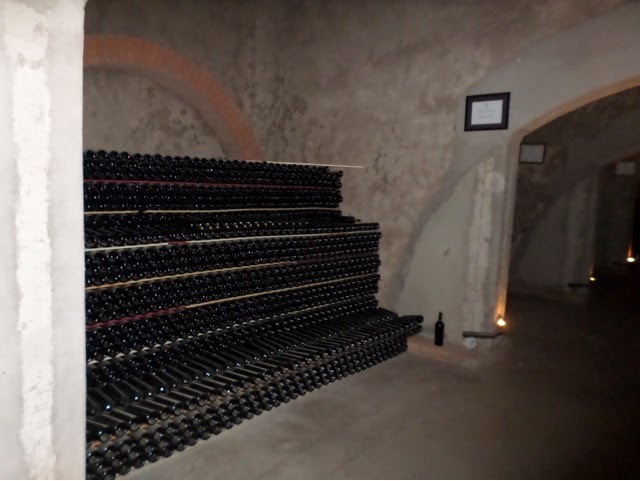 For wines aged for two years from three to six years and for three years between three to eight years…. We returned to town from our wine tasting around 5pm, just as all the shops were opening up again and I went on a shopping mission with Michelle to find her some jeans… We failed… But we had amazing empañadas for dinner that night. The next day I headed out for a full day excursion with Lindsey, Peter and David. We drove out towards the Andes and had incredible views. Although as the border had been closed for the last three days due to heavy snow there was a huge backlog of traffic and lorries on the road. The Andes, heading out towards the border. We drove out to a main centre with great views across a lake. From here we headed off to a local riding centre… To ride horses! I’d not been on a horse since I was eleven years old so it was very exciting. 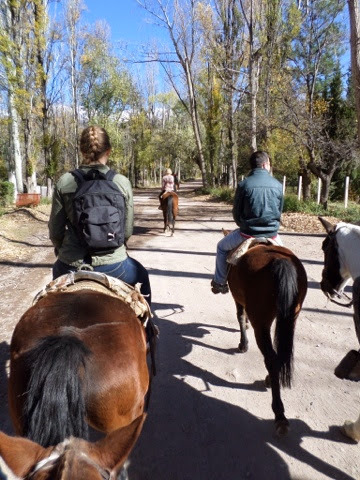 We got saddled up and headed out first we road our across beautiful tree lined streets, then we cut off onto a tiny track with great views of the mountains. My horse was lovely, if a bit slow and I think I would enjoy riding more if I got the chance. Our guide… Or gaucho 🙂 LOVED the outfit! Look I’m on a horse! We had a buffet lunch back at the centre overlooking the lake and then got kitted out in a wet hear for rafting. 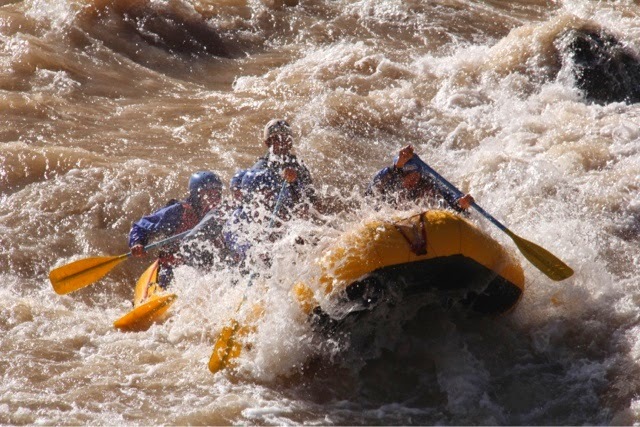 As it’s coming into winter the water levels are pretty low and the rapids are only around da grade three, so they are pretty tame. But to be honest it was still very fun and it meant we had the chance to stop and admire the scenery in places. I was at the front of the boat and there was one moment when I almost went in :-). The water was pretty cold and I got extremely wet but it was great fun and our guide Diego was great. The next day we left to cross the border and head back into Chile, headed for the capital Santiago. This had been a bit of a source of stress as the border had been closed due to heavy snow and avalanche risk for several days. Luckily we had a few sunny days and the border opened for us… It was frankly the most stunning drive of my life… And requires an entire blog post of its own I think! 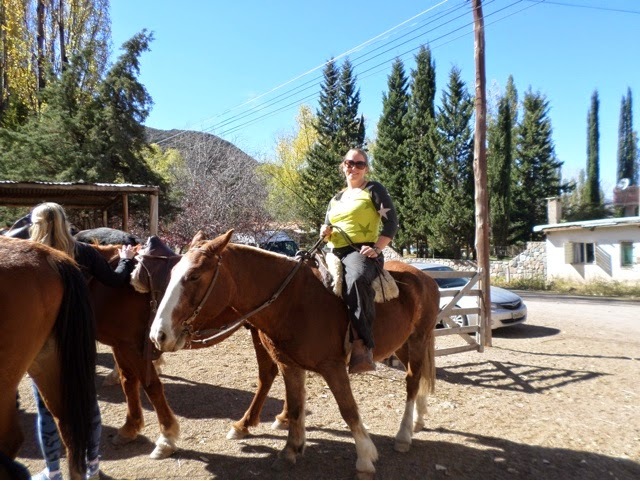 This entry was posted in Travel and tagged Alfahores, Andes, Argentina, Dulche de Leche, Gaucho, Horse riding, Intrepid, Malbec, Mendoza, Pistachio, rafting, riding, South America, SouthAmericanAdventure, Susan Balbo, Travel, Vineyard, white water rafting, Wine, Wine tasting, Wineries. Bookmark the permalink.